With summer upon us, we would like to take a moment to think about how warmer temperatures will begin to affect workers who must be outside. In this two part series we will examine how to prepare for warm weather work and how to avoid environmental emergencies. Heat Acclimatization refers to biological adaptations the body undergoes that reduce physiologic strain, improve physical work capabilities, improve comfort and protects vital organs from heat injury. The most important biological adaptation from heat acclimatization is an earlier and greater sweating response, and for this response to improve it needs to be invoked. Heat acclimatization occurs when repeated heat exposures are sufficiently stressful to elevate body temperature and provoke profuse sweating. Resting in the heat, with limited physical activity to that required for existence, results in only partial acclimatization. Physical exertion in the heat is required to achieve optimal heat acclimatization for that exercise intensity in a given hot environment. Generally, about two weeks of daily increased heat exposure is needed to induce heat acclimatization. In this time the bodies physiological response to elevated temperatures will become more efficient. Sweating will gradually become less profuse, resulting in a lesser chance of rapid dehydration. Blood flow to the skin will be tempered to not deplete circulation to other vital organs and muscle systems. Also a well acclimatized worker will maintain a more stable, predictable heart rhythm as their circulatory response is also better regulated. Although a well acclimatized worker can thrive in warmer environments, should the worker become dehydrated these protections will soon be lost. Dehydration is a typical reason that workers suffer from heat injury. Note the chart below from the National Institute of Health detailing how fluid loss causes a downturn in physical condition. It is for this reason, maintaining good hydration is key for workers in warm environments. 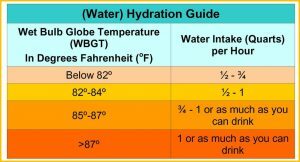 The NIH provides guidelines for water intake based on Wet Bulb Globe Thermometer temperature , which takes into account ambient temperature, humidity, solar radiation, and wind. Dehydrated workers will experience thirst, cramps, dry eyes, dark colored urine, and eventually confusion and organ failure. 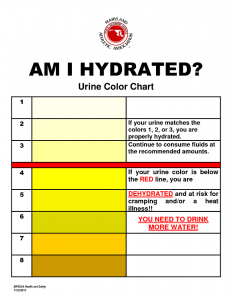 Actively monitoring personal hydration through urine output and color tends to be a most effective way to determine if you’re falling behind in your water intake. In Part II we will examine the symptoms and courses of action for escalating heat emergencies.